What kind of resilience is required to reclaim, even celebrate, a cultural role that’s been riddled by colonial patriarchy for hundreds of years? Pinay rapper Ruby Ibarra knows. In fact, she and her music embody it. Earlier this year on International Women’s Day, Ibarra released the music video for “US,” a defiant anthem that empowers and recognizes the strength of Filipino women featuring Pinay rappers Ibarra, Rocky Rivera, Klassy, and Faith Santilla. 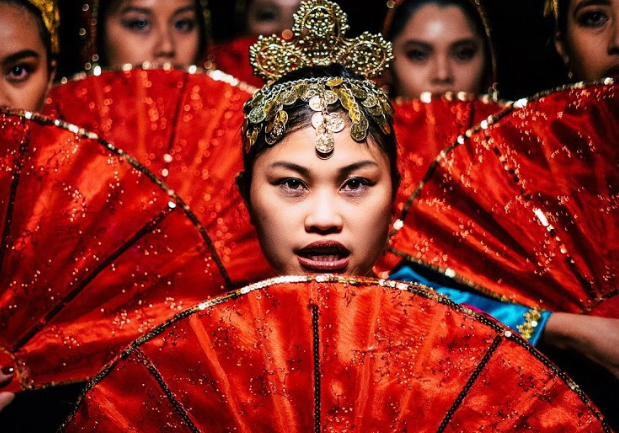 The video is an unapologetic tribute, featuring Filipino women in traditional garb paralleled by quick cuts of their modern-day appearances, weaved together by expertly alternating verses in Tagalog and English. 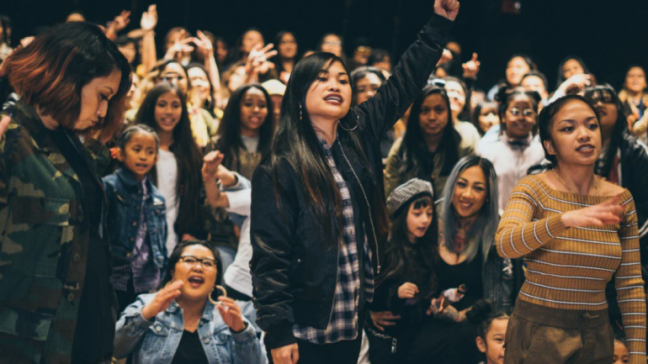 In collaboration with co-director Evelyn Obamos, Ibarra premiered her directorial debut Nothing on Us: Pinays Rising to a packed house at CAAMFest36, a documentary that goes behind the scenes of the “US” music video. The film tells the story of how she crowd sourced an all-Pinay cast of 200 to bring her ambitious vision to life — the hardships, the successes, and the adversity involved when tasked with rising above perception to reveal the true backbone of Filipino culture: its women. Here, we chat with Ibarra, Obamos, and the music video’s videographer and editor Dale Keano, about filmmaking, identity and resistance just before their CAAMFest debut. How did you first get into filmmaking? What was it exactly that first compelled you? Evelyn Obamos: My earliest memory of filmmaking goes back to when my parents documented a lot of my sister and my childhood on their 8mm video camcorder. I taped videos and fiddled with every button until I knew what they were for. Unfortunately, a lot of the footage is on VHS tapes or DVDs that are hard to play back. Fast forward in time and you’ll see my interest in filmmaking peaked through a program called Saber Media at my alma mater, James Campbell High School in Ewa Beach, Hawaii. We didn’t have the flashiest equipment, but during our senior year, my best friends and I entered every contest we could and ended up winning a ton of awards. I was always drawn to the storytelling aspect of filmmaking and the production process continues to be a framework I apply in several aspects of my life — from the glamour to the grit. Not a lot of people see the work that goes into producing a film, or even a short 30-second video. As a filmmaker, I like dissecting the process, observing every shot, and analyzing how an edit was done. Dale Keano: I grew up around music and filming. My dad used to run a recording studio back when I was 10 and he would always bring me to studio sessions. He then got into filmmaking and would bring me along to sets. I’ve always been a musician. In college I picked up producing and eventually got to start my own record label. My true passion is learning and getting things done. I knew starting my label that I had to know how to do everything to increase my value. First engineering, then designing and finally video. Video became such a big part of my life that I started getting inquiries from other artists and companies. This then became the catalyst to opening my studio. In what ways does your background or your family’s background influence the stories you tell? Ruby Ibarra: Everything about my music is influenced by my background and by my family’s experiences. My most recent album, CIRCA91, shares in great detail our experience as first generation Filipino Americans living in the Bay Area. When I first started doing music, my main concern was honing my skills and perfecting my craft. It wasn’t until early last year, while I was making my debut album, when I truly thought about the kind of discography I want to create, and what I want my music to mean to people. Growing up as a huge hip-hop fan, it was always the albums that told stories that impacted me the most. That’s why I want to continue creating records that resonate with people. Evelyn Obamos: I credit a lot of who I am today, my intrinsic motivations, to my complex upbringing. As a second-generation immigrant, first-generation American-born Pinay, I constantly dance between a duality of worlds, grappling with an ever-evolving identity, reconciling contradicting realities. Storytelling serves as a process to unravel the chaos. In many ways, I’ve found solidarity within myself and with others who identify with the same struggles. How did the two of you meet Ruby Ibarra? Can you share the story of your collaboration with her? Dale Keano (music video): Ruby and I graduated from UC Davis. I first saw her and her sister perform live at an open mic I frequently went to. I was blown away by their performance and became an instant fan. Back then I was only producing music — R&B. At the time, our styles didn’t match. Fast-forward 10 years; we’ve maintained contact through social media. Before her Mastercard placement, she reached out to me. Then after, she hit me up the same day to get videos filmed. Evelyn Obamos (documentary): I was first introduced to Ruby’s music through a CD mix that a friend made — an album of Asian American YouTube artists. The list included her and her sister Donna’s cover of “Best I Ever Had” with her Tagalog rap verse on repeat! 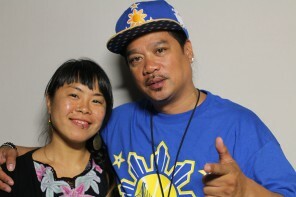 I think we were on the same line-up at one gig at SFSU when we were in college, but it wasn’t until recently that I officially met her through mutual friends (Hi Joy & DJ Mister Rey!). The music video is a powerful tribute to Pinays and women. Why is this video is important in 2018? Ruby Ibarra: The response that this music video has received is a testament to why it is important in 2018. A lot of the feedback we’ve received echoes sentiments around representation and visibility. These comments serve as a reminder that a lot of people in this country still feel invisible and still feel their stories are not being told. Behind the scenes of making “US” music video. Who is your intended audience with your documentary “Nothing on Us”? What do you hope people take away? Ruby Ibarra: My intended audience for the Nothing On Us documentary is everyone — from Filipinas, to people who watched the “US” music video, from hip-hop fans, to people who just love videos. I think this documentary has something that will inspire and resonate with everyone. The fundamental intent was to capture the process behind making a music video. Often times, music videos get admired and celebrated, but the audience never sees all the hands and help that went into creating that project. I wanted this documentary to focus on the community: everyone from the amazing videographer Dale, to the gaffers, to the dancers and volunteers. I want people to see that nothing is built alone and that everyone is stronger with a team behind them. Evelyn Obamos: Do y’all remember when Beyonce’s Lemonade album came out? When the “US” music video launched on International Women’s Day, I told a friend: “This must be how the Beyhive felt.” Seeing responses to “US” from the community, whether in close circles or the larger global audience, really showed how a moment became a movement. I’m hopeful that the next generation of Pinays will grow up learning their experiences are valid, as well as learning how to dissect colonial mentality. Who or what inspires you in your art? Dale Keano: You increase your value when you know how to do more things and are good at it. I’m inspired by jacks-of-all-trades: Ryan Leslie for producing to songwriting to managing a team and J. Reyez for rapping to learning how to direct/edit videos. Ruby Ibarra: Stories that don’t usually get the spotlight inspire my art and by my mother, Lauryn Hill, Eminem and Kendrick Lamar. Evelyn Obamos: I draw a lot of inspiration from everyday experiences: the mundane to the magical. Art can be a cathartic process, especially when your medium doesn’t have a lot of people that look like you. Ethnic Studies, too, plays a huge role in shaping my identity as an artist. What, in your mind, is the cultural role of the music video form? Ruby Ibarra: In this climate where platforms such as YouTube, Instagram and Facebook rule supreme, the music video format is certainly the most important tool for a musician. Visuals are more important than ever. We consume, then dispose of them much quicker than before. Growing up in the 90s, I was introduced to rap videos during a time when creativity was such a big component. We saw artists like Busta, Missy, and Diddy really push the envelope in what music videos could accomplish in a mere three and a half minutes — from special effects to a cinematic look. Do you have a favorite part of filmmaking? Least favorite? Dale Keano: I love the filming experience. Setting up the cameras, lighting, rehearsing the shots, filming, trying different angles and directing the crowd. My least favorite part is editing. I love it but it takes forever. Evelyn Obamos: I can’t wait for the days when rendering and exporting become a fraction of the wait time it is now. The worst part of video editing is waiting hours on end for an export and then seeing a typo or error on the playback. It’s the worst, but it’s also helped me be more detail-oriented as an artist. That’s what I love about the whole process. I’m always learning. What are ways in which you practice self-care? Ruby Ibarra: As busy as my schedule gets sometimes, I never forget to take at least one hour of the day to do something outside of music and creating. Taking a little break every so often is imperative to staying balanced and refreshed, and also keeps us driven and inspired. Also, eat and live healthy! As a performer, my voice and my body are my main instruments on stage. Evelyn Obamos: Self-care looks different for many people. Last year my theme was to be more intentional about where I spend my time and with whom I spend it with. So I started carving out time on the weekends to practice, what I call, my three R’s: run, read, and reflect (write.) I’m totally outing myself now, but sometimes I’ll tell folks that I am busy on the weekends when really, I’m by myself at my favorite cafe. I used to feel guilty for rejecting invitations, but that’s something I continue to work on, too. What advice might you give to a young Asian American creative? Ruby Ibarra: Know that you have a voice and an audience. Own that space. Don’t ever let people make you feel like you aren’t marketable enough or that you don’t have a platform. There are so many people out there that want to hear your story and see your art, and it is important for us to continue paving that path because representation is important. Evelyn Obamos: Sometimes what you do may feel like you’re carrying the weight of your community on your back. Moreover, if you’re in a situation where you can easily be tokenized. It’s important to be very self-aware and recognize the systemic powers at play in every step of the process. It can be isolating when you feel alone in your work and the message you hope to amplify. So identify the people who’ve seen where your roots are planted, who have watched you grow. Have allies and constantly ask for constructive feedback from people you respect. Dale Keano: Do it. If you’re interested in something, do it. Quit with the excuses. We all have the same time in a day. If you are really passionate about something you will find a way. Ruby Ibarra meets fans at #CAAMFest36: “Anatomy of a Music Video with Ruby Ibarra” at The Roxie Theater. Photo by Erina Alejo. What are you looking forward to at CAAMFest? Dale Keano: For more eyes to see our work! Ruby Ibarra: Of course, I’m looking forward to seeing the documentary on the big screen, but I am also just as excited to watch the other films in the festival! I’ve been particularly excited about Ulam and Bitter Melon. Evelyn Obamos: I’m excited to see folks roll up, all decked out. I’m hoping they all come through like the Black Panther screening where folks wore their best takes on traditional meets modern style. CAAMFest’s tagline this year is “Culture, in Every Sense.” What does that mean to you? Ruby Ibarra: CAAMFest’s tagline is everything that my music is about. I try to incorporate stories about where I am from because I know how dynamic the immigrant and POC experience is. These are all stories that we do not typically see highlighted in mainstream media. As a first generation Filipina American, I am definitely proud of my heritage and aim to celebrate that whenever possible. Evelyn Obamos: Our interpretations of culture are constantly shaped, in essence, by every degree of our experience — from food to the people we surround ourselves with. I’m grateful for moments that teach me more about myself, that reveal new dimensions of how people identify. The tagline drives an important theme home, acknowledging how our senses play an important role in our experiences, especially in shaping our culture. Let’s be real: craving the flavors of Filipino food is hella part of my identity. Are there other projects down the line that you’re excited about? Dale Keano: More Ruby videos! Most importantly, more mainstream quality videos from our community. Ruby Ibarra: More music videos created through the Burgundy Suite team and more new music later this year!